We had the annual meeting of our association Ulla (we have an association that publishes the knitting e-zine Ulla). As a nice coincidence, on the same evening the news story on knitting (that was filmed on Tuesday) was on the news, so we added one more item to the agenda and watched the news. Ninni was the main thing but the reporter also interviewed Niina who represented Ulla as the vice president. I was way too shy, so had you been looking for me, you have caught only my shoulder in one shot and my knee in another shot as I was knitting the Fifi scarf from blue Lana Grossa Velvet. The news story was good, so wow, now some of us have had the 15 minutes of fame. Hopefully there will be more of that. 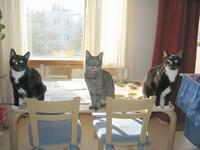 And now for something completely different: you can always get a friend or three when you open a tin of tuna. What a nice blog and nice page! And nice knitting indeed. I myself...have knitted a bit. Have not commented much...My life is just waiting...endless waiting. A job...that is the reason. But when the time is right...I hope someone finds me suitable. Anyway, your blog is nice and pics are super nice.